Hello. 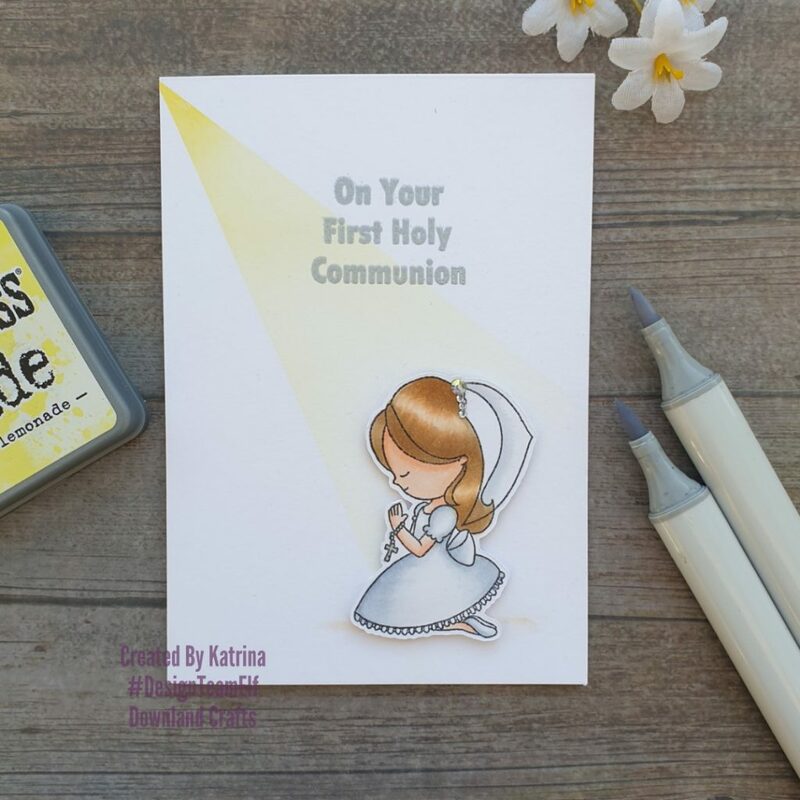 Today I am sharing a First Holy Communion card featuring a stamp set from Downland Crafts called Communion kneeling. I started the card by first stamping the little girl image on to a panel of Neenah cardstock the same size as my card base using Memento tuxedo black ink. I then used my Copic markers to colour the image but you can use whatever colouring mediums you have. Once she was coloured I cut the image out then used a Spectrum Noir clear sparkle pen to add some glittery shine to the dress and hair piece. You can’t see in the photo but this adds some lovely sparkle. I also added some gems on to her hair piece using liquid glue and a gem picker. Next I worked on the background. I took some craft masking tape to mask off an area of the card which looked like there was a beam of light shining on the girl. 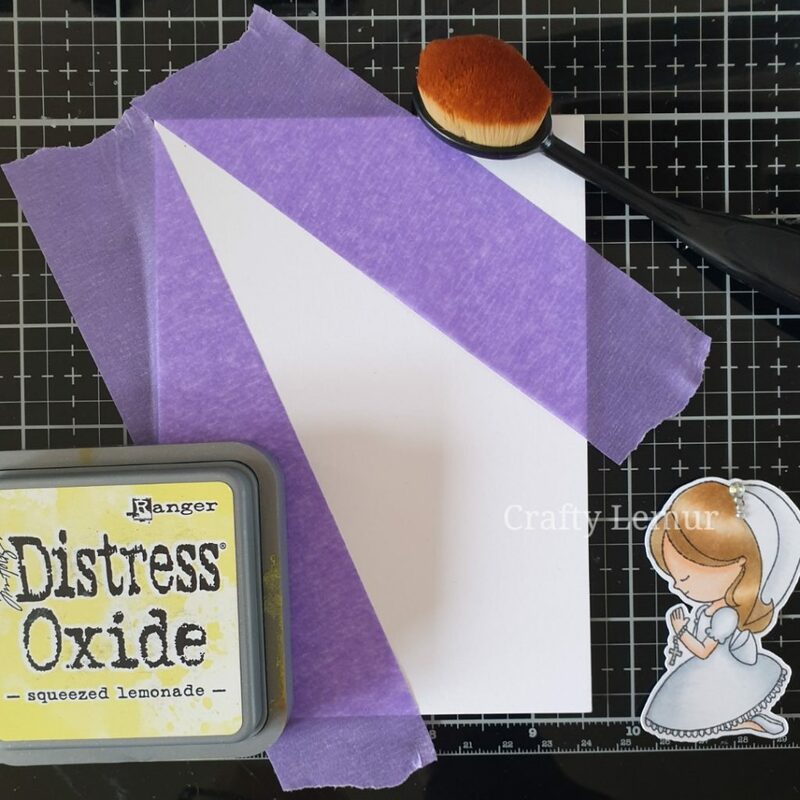 I used yellow Distress Oxide ink in Squeezed Lemonade which I added to the card using a blending brush. Once I was happy with the colour I removed the tape. To add the sentiment I stamped it using a Versamark embossing pad the sprinkled on some silver embossing powder. I then heated it with my heat tool. To complete the card I used foam pads to adhere the girl and adhered the panel to a card base. I hope you like the card and are inspired give it a try. I love the ray of light, such a great technique. Thanks for sharing.